Pretty and practical, these zippered bags with side loop handles are quick and easy to make. Add a clear vinyl lining for an easy to clean cosmetics bag. 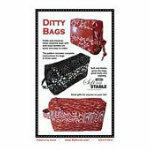 Pattern includes complete instructions for bags in three sizes.